Today the recurring theme of Our Lord’s miracles is reaffirmed through His doctrine which filled the Jews of Nazareth with wonder (Communion). Christ is our King for He welcomes not only Jews but also Gentiles into His kingdom. Called through pure mercy to share in the Mystical Body of Christ, we must ten in our turn, show mercy to our neighbour since we are made one with our neighbour in Christ Jesus (Epistle). In doing this we shall have need of patience, since in God’s kingdom here on earth there are both good and bad, and it is only when our Lord comes to judge men, as described in the Last Sunday of the temporal cycle, that He will separate the one from the other for all Eternity. This especially hits home today with the crisis Holy Mother Church has been undergoing where so many cockles from Vatican II have been sown among the wheat that it has choked out most of the good wheat, but we must have faith that our Lord will separate through divine intervention the True Catholics from those who would pose as Catholics. 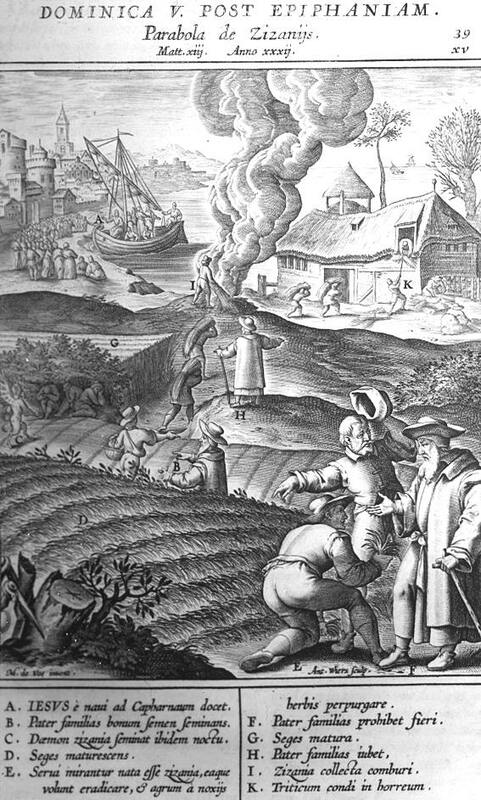 The evil sower is the devil and he sows the dark cockle, which is a violent poison. The servants of the good man of the house represent the Angels; they wished to separate the good from the bad. But it is impossible to separate them until the time of the harvest i.e. the time of the last judgement then will Divine Justice make the necessary separation. St. Cuthman was venerated as a saint before the Norman Conquest. After the conquest his relics were transferred to Fécamp, since the Steyning church had been given to the Abbey there. In charters of William the Conqueror Steyning is sometimes called “St. Cuthman’s Port” or “St. Cuthman’s Parish”. In “lives” which were preserved at Fécamp it is said that he was born about 681 A.D., probably at Chidham, near Bosham, which is about 25 miles from Steyning. If this is so, his parents would have heard the preaching of St Wilfrid, the Apostle of Sussex (680-685), and no doubt became Christian. Did Wilfrid himself baptise the child Cuthman? Some authorities give him a date later than this, but at least it can be said that Cuthman’s church was in existence in 857, for we know that King Ethelwulf was buried there in that year. Adore God, all you His angels: Sion hears and is glad, and the cities of Juda rejoice. Ps 96:1 The Lord is King; let the earth rejoice; let the many isles be glad. V. Glory be to the Father, and to the Son, and to the Holy Ghost. R. As it was in the beginning, is now, and ever shall be, world without end. Amen. Adore God, all you His angels: Sion hears and is glad, and the cities of Juda rejoice. O Lord, we beseech You to keep Your household continually under Your mercy: that as it leans only upon the hope of Your heavenly grace, so it may always be protected by Your mighty power. Through Jesus Christ, thy Son our Lord, Who liveth and reigneth with thee, in the unity of the Holy Ghost, ever one God, world without end. R. Amen. O Lord, saviour and keeper of those who seek Thee, who didst grant Blessed Cuthman, undefiled, to renounce this world and to flee to the protection of thy wings; grant by his intercession that thy people may have grace to flee from the contagion of the evil one, and to follow thee alone with a pure heart and mind. Lesson from the letter of St. Paul the Apostle to the Colossians: Brethren: Put on, as God’s chosen ones, holy and beloved, a heart of mercy, kindness, humility, meekness, patience. Bear with one another and forgive one another, if anyone has a grievance against any other; even as the Lord has forgiven you, so also do you forgive. But above all these things have charity, which is the bond of perfection. And may the peace of Christ reign in your hearts; unto that peace, indeed, you were called in one body. Show yourselves thankful. Let the word of Christ dwell in you abundantly: in all wisdom teach and admonish one another by psalms, hymns and spiritual songs, singing in your hearts to God by His grace. Whatever you do in word or in work, do all in the name of the Lord Jesus Christ, giving thanks to God the Father through Jesus Christ our Lord. The nations shall revere Your name, O Lord, and all the kings of the earth Your glory. V. For the Lord has rebuilt Sion, and He shall appear in His glory. Alleluia, alleluia. V. Ps 96:1 The Lord is King; let the earth rejoice; let the many isles be glad. Alleluia. The right hand of the Lord has struck with power: the right hand of the Lord has exalted me; I shall not die, but live, and declare the works of the Lord. We offer You, O Lord, this sacrifice of atonement, that You would mercifully absolve our sins and direct our faltering hearts. Through Jesus Christ, thy Son our Lord, Who liveth and reigneth with thee, in the unity of the Holy Ghost, ever one God, world without end. R. Amen. Take from us, O Lord, all worldly desires, that we might worthily serve at thy altar; and grant us to follow the example of him, in whose honour we offer this immaculate sacrifice to thy divine majesty. Through Jesus Christ, Our Lord. All marvelled at the words that came from the mouth of God. We pray You, almighty God, that we may obtain that salvation whose pledge we have received in this divine sacrament. Through Jesus Christ, thy Son our Lord, Who liveth and reigneth with thee, in the unity of the Holy Ghost, ever one God, world without end. R. Amen. We beseech thee O Lord by the virtue of this Sacrament, to grant us the grace to follow the example of Blessed Cuthman in thy service: and may that good work which thou hast begun in us, be brought to perfection in the day of Christ Jesus Our Lord. May the oblation of this divine sacrament cleanse and defend us, we beseech Thee, O Lord, and, through the intercession of the blessed Virgin Mary, Mother of God, with blessed Joseph, Thy blessed apostles Peter and Paul, blessed N. (here mention the titular saint of the church), and all the saints, purify us from all our sins and deliver us from all adversity. Through our Lord Jesus Christ, Who livest and reignest, with God the Father, in the unity of the Holy Ghost, one God world without end. R. Amen.